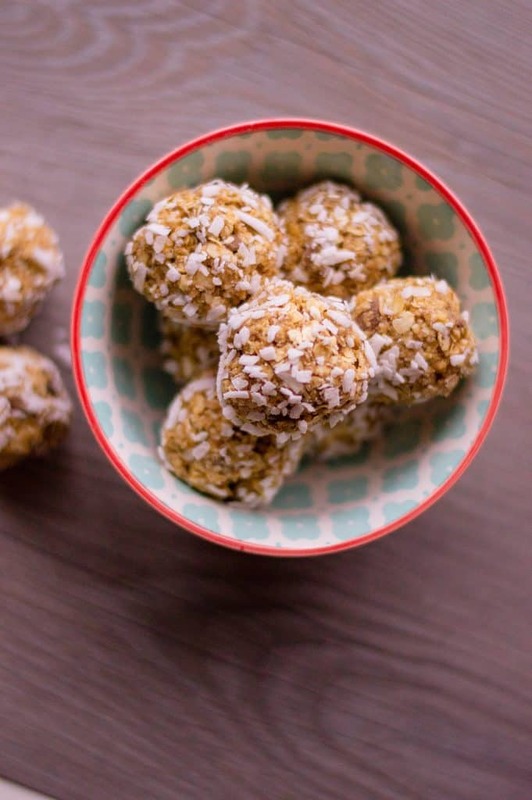 Have you tried these Easy No Bake Energy Bites? They are so easy to make and you can add any of your favorite flavor mix ins. When you are an on the go parent– and easy recipe is so nice! There are so many delicious ways to make Energy Bites. You can make Peanut Butter Energy bites, Energy Bites with Dark Chocolate or Cranberry Energy Bites. My days seem to be packed full from the moment I wake up to the moment I fall asleep so I appreciate a No-bake treat to keep me going. I’m sure you have been where I am. Kids pull you in so many directions that you can need an easy recipe to keep you on your toes. If not, by the end of the day I am a wreck. These Easy No Bake Energy Bites are fast to make and taste great, too! We have so many great recipes that are perfect for parents on the go. I love when I can make a larger batch ahead of time and have a easy snack on the go. 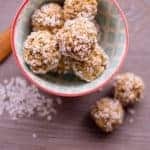 Our Peanut Butter Protein Bites are a delicious choice, or our Protein Granola if you are looking for a make ahead recipe. 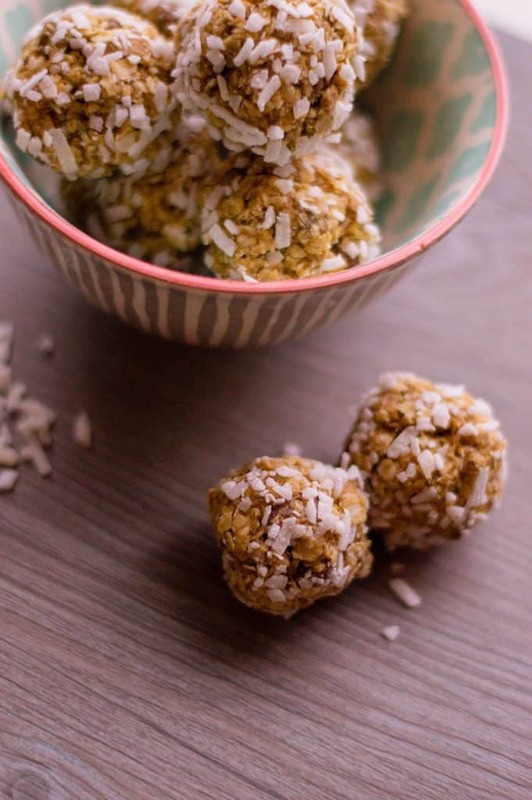 This No Bake Energy Bites recipe is great to stock up on the healthy ingredients so you can make a batch whenever you are in need of extra energy. This recipe is fast to make and tastes delicious. To prep your recipe, line your baking sheet with wax paper and put your coconut flakes ready in a small bowl. Grab a large mixing bowl, and fold together almond butter, oats, chia seeds, and honey. You may add more honey and/or oats depending on how sticky your batter is coming out. You’ll want it to feel like wet sand (so that you can roll them into bites). Fold in dark chocolate chips and start rolling into 1-inch spheres. Coat with coconut flakes and set on lined baking sheet. Repeat. Chill for at least one hour and enjoy! 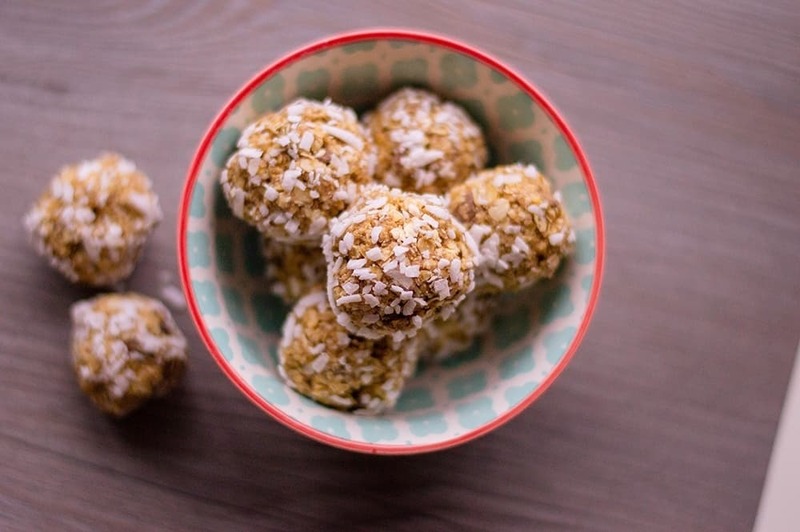 These easy no bake energy bites are a fast on-the-go snack. 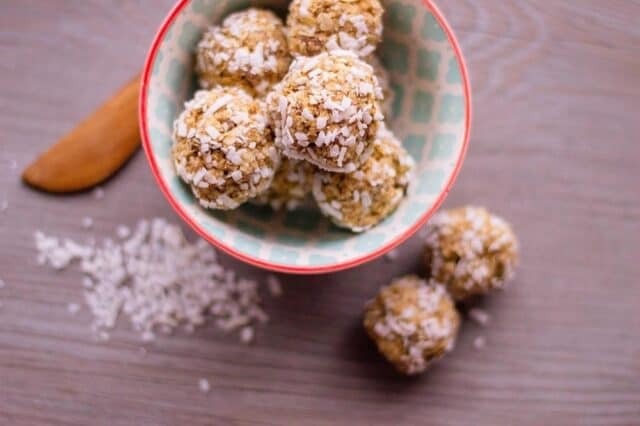 Energy balls with dark chocolate chips and coconut taste great and make a great snack. To prep, line a baking sheet with wax paper and have your coconut flakes ready in a small bowl. In a large mixing bowl, fold together almond butter, oats, chia seeds, and honey. You may add more honey and/or oats depending on how sticky your batter is coming out. You’ll want it to feel like wet sand (so that you can roll them into bites). Fold chocolate chips into your energy balls and start rolling into 1-inch spheres. Coat with coconut flakes and set on lined baking sheet. Repeat. Chill Energy Bites for at least one hour and enjoy!